The VBA Help system describes every object, property, and method available to you, and also provides sample code. This is an excellent resource for finding out about VBA, and it is more comprehensive than any book on the market. But it’s also very boring to read. If you’re using Excel 2013 or later, you must be connected to the Internet to use the VBA Help system (previous versions don’t have this requirement). You can, however, download the VBA Help system from Microsoft’s website. Do a web search for download excel vba documentation, and you’ll find it. If you’re working in a VBA module and want information about a particular object, method, or property, move the cursor to the word you’re interested in and press F1. In a few seconds, you see the appropriate Help topic displayed in your web browser, complete with cross-references and perhaps even an example or two. 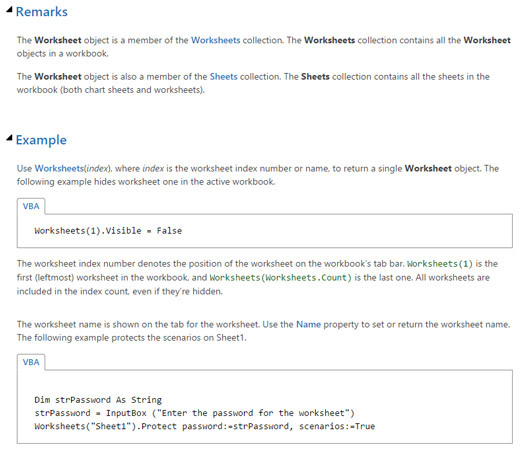 Here is part of a screen from the VBA Help system — in this case, for a Worksheet object. An example from VBA’s Help system. The VBE includes another tool known as the Object Browser. As the name implies, this tool lets you browse through the objects available to you. To access the Object Browser, press F2 when the VBE is active (or choose View → Object Browser). 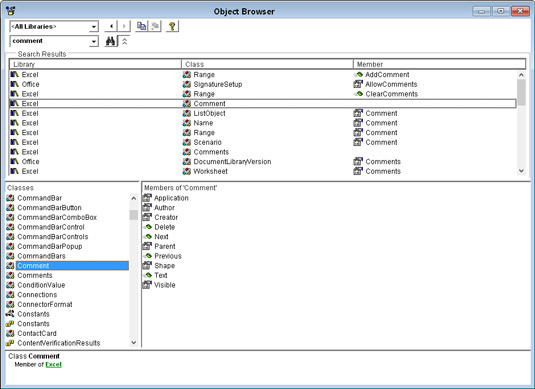 Browsing for objects with the Object Browser. The drop-down list at the top contains a list of all currently available object libraries. Above, you can see All Libraries. If you want to browse through Excel’s objects, select Excel from the drop-down list. The second drop-down list is where you enter a search string. For example, if you want to look at all Excel objects that deal with comments, type comment in the second field and click the Search button. (It has a pair of binoculars on it.) The Search Results window displays everything in the object library that contains the text comment. If you see something that looks like it may be of interest, select it and press F1 for more information online. There is a handy feature called Auto List Members. This feature provides a list of properties and methods as you type. 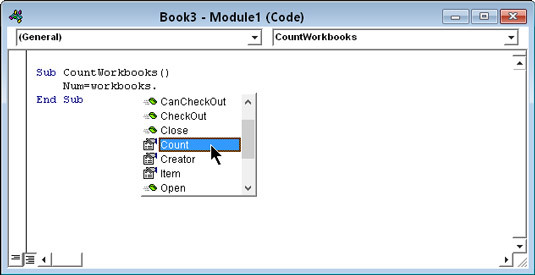 Here is an example for the Workbooks collection. The Auto List Members feature helps you identify properties and methods for an object. After the dot after workbooks was typed, the VBE volunteered to help by displaying a list of properties and methods for that collection. After the c was typed, the list was narrowed to items that began with that letter. Highlight the item you need, press Tab, and voilà! You’ve eliminated some typing — and also ensured that the property or method was spelled correctly.